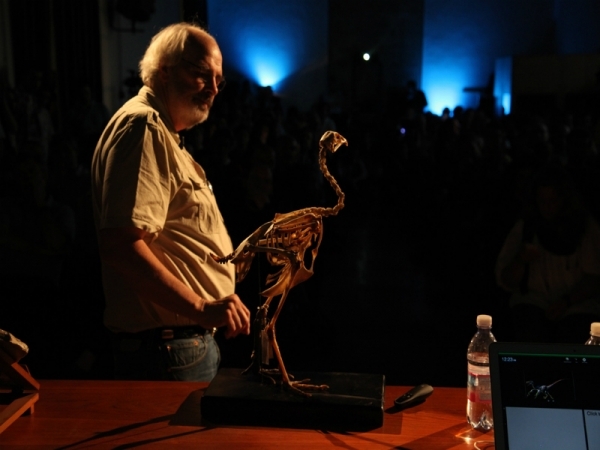 Real blood cells in 65 million year old dinosaur bones? “Well, you had this information and you didn’t even mention it?” I dropped the magazine in front of her. In 1961, a petroleum geologist discovered a large bone bed in northwestern Alaska. Among these were bones of duckbill dinosaurs, horned dinosaurs and large and small carnivorous dinosaurs. At the time, William Clemens and other scientists from the University of California and Berkeley and the University of Alaska were quarrying the bone bed. It took 20 years for scientists to accept that these were dinosaur bones. An initial announcement was printed in 1985 in Geological Society of America abstract programs vol.17, p.548. Now, here is the problem: these bones are still in fresh condition. They are not fossilised. Is this because they were preserved by cold? Not at all. It is standard geological interpretation that even after the dinosaurs died out, the entire planet was much warmer. These developments are certainly food for thought. It is undeniable that fresh dinosaur bones have been found. Items have appeared in the secular literature saying exactly that. It is also evident that preservation in the fresh state for even one million years is highly unlikely. The obvious conclusion is that these bones were deposited in relatively recent times. This bone bed is stunning evidence that the time of the dinosaurs was not millions of years ago, but perhaps only thousands. It is time geologists recognised the implications of their own data. Real blood cells in dinosaur bones? With traces of the blood protein hemoglobin? 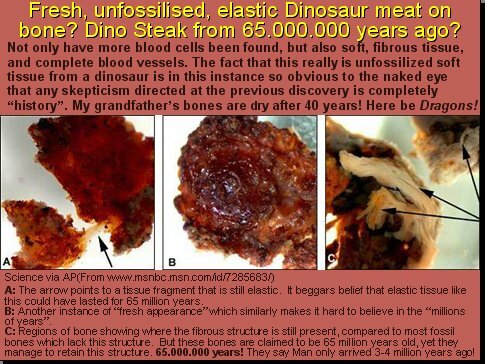 Preposterous!… that is, if you think these dinosaur remains are 65 million years old or more. Okay, let me share with you another discovery. In the United States in 1990, the bones of a beautifully preserved Tyrannosaurus Rex skeleton were unearthed. Mary Schweitzer and her co-workers took turns looking through a microscope at a thin section of this dinosaur bone, complete with blood vessel channels. She says: “The lab filled with murmurs of amazement, for I had focused on something inside the vessels that none of us had ever noticed before: tiny round objects, translucent red with a dark center. 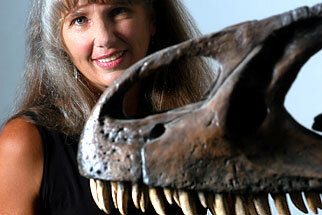 She confronted her boss, famous paleontologist ‘Dinosaur’ Jack Horner. “How about you try to prove they are NOT red blood cells,” responded Horner. The evidence that hemoglobin (the protein which makes blood red and carries oxygen) has indeed survived in this dinosaur bone casts immense doubt upon the ‘millions of years’ idea. * The tissue was colored reddish brown, the color of hemoglobin, as was liquid extracted from the dinosaur tissue. * Hemoglobin contains heme units. Chemical signatures unique to heme were found in the specimens when certain wavelengths of laser light were applied. * Because it contains iron, heme reacts to magnetic fields differently from other proteins – extracts from this specimen reacted in the same way as modern heme compounds. * To ensure that the samples had not been contaminated with certain bacteria which have heme (but never the protein hemoglobin), extracts of the dinosaur fossil were injected over several weeks into rats. this compound. This is exactly what happened in carefully controlled experiments. Evidence of hemoglobin, and the still-recognizable shapes of red blood cells in unfossilized dinosaur bone, testifies strongly that this dinosaur did not live and die millions of years ago. The process of biochemical decay starts soon after death. These cells should long since have disintegrated… unless they are just a few thousand years old. It hasn’t been so long! Previous PostForbidden History: Dinosaurs and the BibleNext PostEvolution Conspiracy Documentary – Must Watch!